Great mod. 10/10. The only bad thing is: there is a lot of old data. 1) A way to let me update my copy of the database to delete old entries. Maybe a Flag For Deletion checkbox? Then if the web server sees a lot of players with that flag, it will actually delete the record. (minimum 10 players? 15? shrug, you decide). 2) A field called Sign last observed: mm/dd/yyyy (and let us filter on that date). 1) should already be implemented. Whenever you visit an area, the client scans for new signs, and it checks if the signs it knows about are still there. If they aren't, it marks them as invalid and sends that information to the server from where it gets distributed to other players. I did test that when I made the mod, but that was a while ago; I'll re-check if it still works. 2) This field actually already exists in the database to implement (1), clients send their "i saw this sign on ..." or "this sign was gone on ..." information along with the signs; the server selects which one is newest. (If you look at your local database, it's the last column the number that begins with 15..., in java timestamp format). Which means it shouldn't be too hard to implement a config option that says "ignore signs that haven't been seen for more than X weeks". I don't really want to make this a GUI field as people are already complaining about not enough space on the screen with large/auto gui settings. 3) Yes, that's a problem, I only know what the sign says, I can't actually look inside chests in my mod unless the player chooses to open them. (With [CHOOSE] chests, that's what I actually do). I don't want to "fix" those names automatically since players will probably disagree about what to fix, and different players (who use different versions of the mod) uploading different fixed item names would probably create a big mess. What should be possible is giving you an option to place a replacement file in the config folder, which would rename (and merge) items for display, but leave the database itself unchanged. Regarding #3, can you somehow use the item # in the database? (And then in the mod, always display the "current name" of that item # ? Or, if you already do that - possibly a configuration setting that says "Always use current item name" - and then players can choose whether to turn it on or off? First of all: awesome mod, definitely useful for any EMC players. I have one suggestion: by default and if you click a button it'll disable that SMP. Would it be possible to add a toggle option? 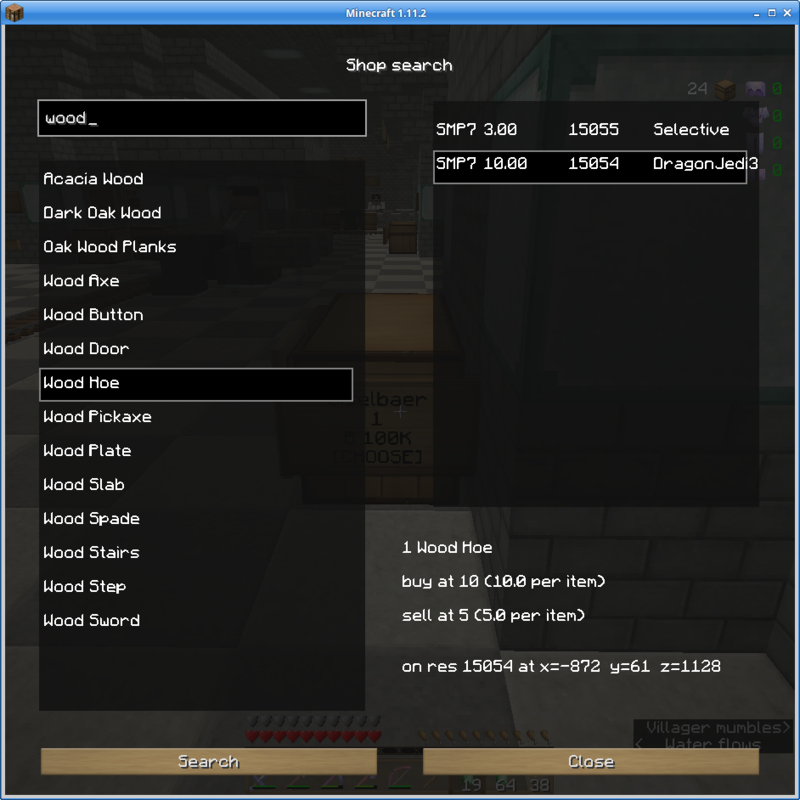 This might come in handy if you're only interested in shops on the SMP you're on. 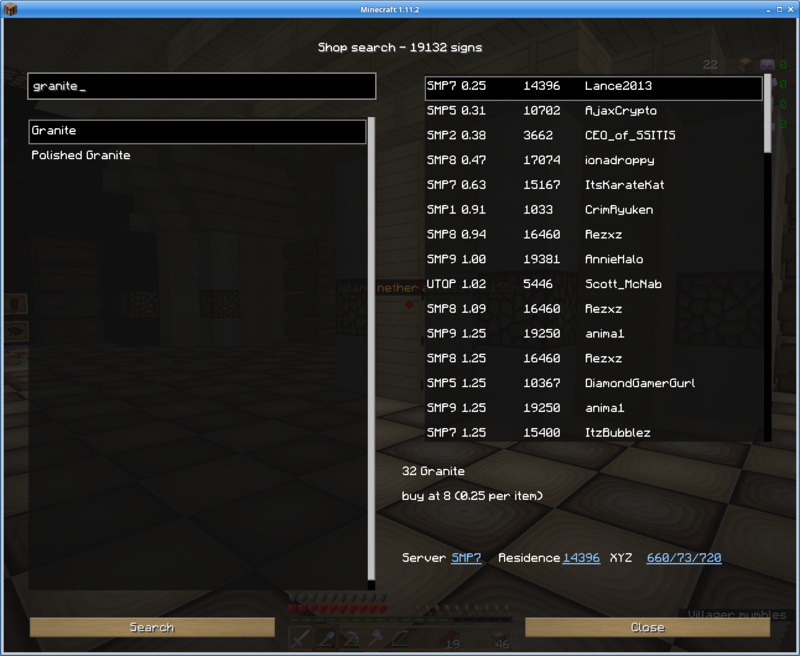 So, example: I do a search and I only want to know about shops on SMP2. I control-click on the SMP2 button and instead of disabling SMP2 it would disable all the other servers this only showing SMP2 shops. Good idea, will implement this!